Cold Ash do not operate a booking system for general play which has always operated very effectively on a first come basis, with the help of the few simple Rules of Play which we ask members to adhere to if others are waiting to play. 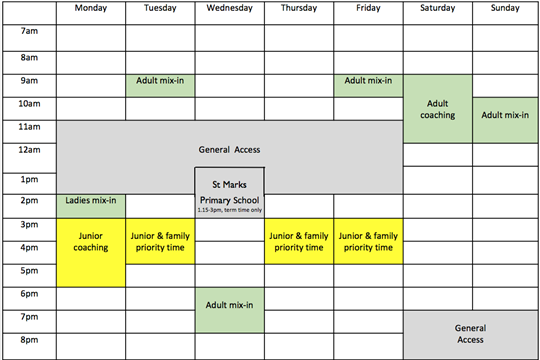 The court timetable (an alternative version of which you will find at the bottom of this page) sets out regular times each week when priority is given to various activities such as mix-ins and coaching. Priority is also given to Club participation in district League Tennis competition and this generally involves a total of about a dozen home fixtures each year (mostly scheduled on weekdays starting at 6pm). Unfortunately these fixtures often have to be organised at relatively short notice but dates and times when the courts will closed for general play will be posted on the court side notice board by club captains giving as much notice as possible. Added together, all of these prioritised activities take up less than half of all available playing time. All remaining time (where no marked sessions are shown on the timetable) is available for paid up club members to use the courts as they please. For most of the year, if you choose your time carefully, you should never have a problem getting a game although at peak season around Wimbledon time, morning are much better than late afternoons and early evenings which are often very busy. Members are welcome to bring occasional guests at a charge of £2 per occasion. Members should keep a rough note of these occasions and make a corresponding extra payment at the time of their next membership payment. In agreement with the Parish Council provision has also been made to allow a limited level of access at specific times to members of the public who are neither Club Members nor guests. Shown in the timetable as "General Access", these times are in the middle part of the day on weekdays and late evenings at the weekend. As the courts are locked, non-members wishing to use the courts will need to contact the Parish Office adjacent to the courts to book, pay and arrange access (01635 860004). The charge payable is £2 per person per hour. (Whilst not wishing to discourage the one off user it should be noted that even the most expensive category of full membership works out at less than a £1 a week and gives unrestricted access and your own court key).